I believe they’re based in Germany. 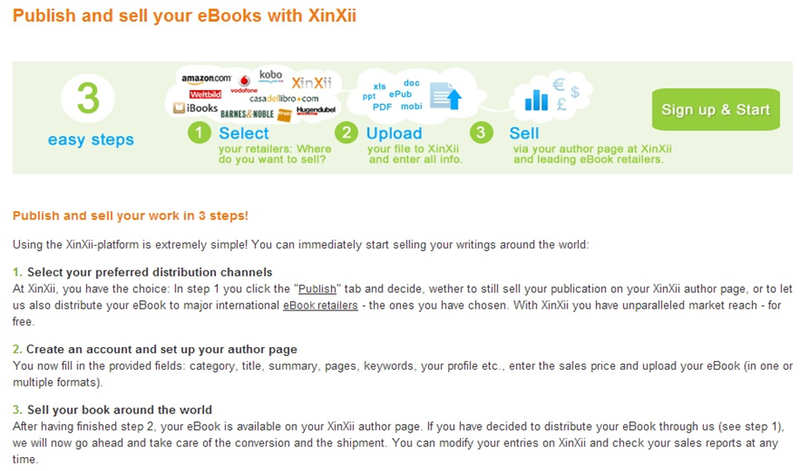 Because of that, if you want to publish with them I highly recommend reading the Xin Xii FAQ page. It will answer questions you might have about a foreign business and their practices. At any rate, I stuck 5 shorts up there, and here it is nearly 2 years later, and not one sale. From what I read on their site, they are organized like Smashwords in their distribution. 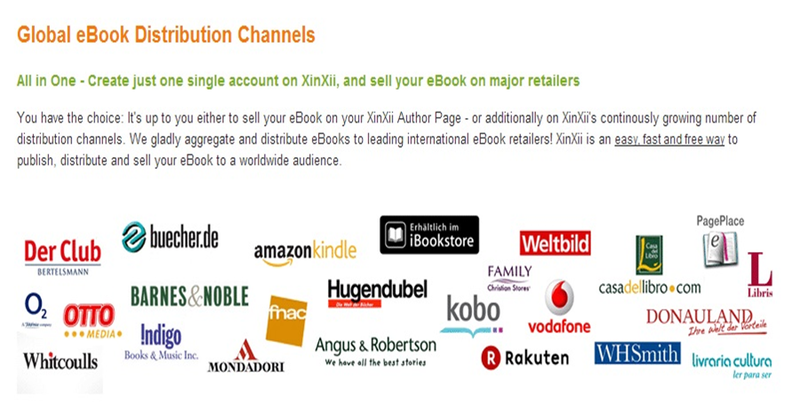 Supposedly if you upload to them, they will distribute to over 20 different eBook sites around the world. Maybe I missed something, or maybe they just aren’t well-known here in the U.S.A. I would’ve thought that by now I’d have sold ONE copy of something. Most of my stories have had over 700+ views, but alas, no sales. And I priced them set at .99, so I’m not breaking any banks. Here are their distribution channels—pretty impressive looking. Most of the sites are German, several are US/UK, some Spanish, and even a Christian eBook store. If you want to publish on the site for free, select the Plus package. Most of us already have an ISBN for our works, so I can’t see anyone paying $24.99 to just get that. You can see how many people have viewed the book page, sales rank, sales, and any comments about it. The format I used for upload is a standard PDF, but there are more available. Because of the monetary conversion rates, your royalties aren’t particularly good. On a story priced at .99 cents, by the time everything is said and done, I make .33 cents. This is only slightly better than Barnes & Noble. 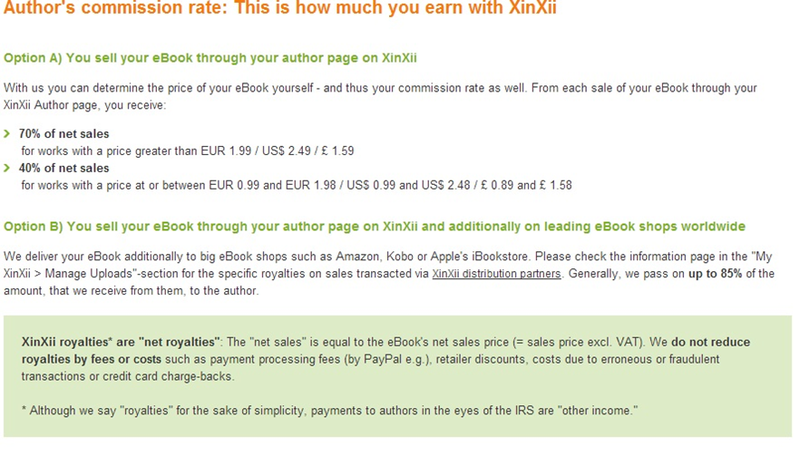 A $3.99 book in the U.S. will sell for €1,99. You can select PayPal, or if you live in Europe, a bank transfer. It took maybe 10 minutes to upload my “Space Junk” novel. It was available for sale before I finished writing this article, and already had 8 views from potential customers. So you can’t say Xin Xii is slow about getting your work up there. Most of the publishing steps are similar with sites like Amazon and Smashwords, and they offer author pages where you can send folks to. They have a marketing page in order to help you get the word out. Overall, the site is pretty easy to navigate—especially if you’re a pro at doing the others. I can’t say that Xin Xii has put a single penny in my pocket, but perhaps someday someone will find a tasty morsel of mine and I can consider it a success. However, in the Indie author business, it’s not a matter of how many books you write (although more is better) but how many people can see and purchase your work. For more information, be sure to check out Birgit Kluger‘s guest post on global marketing strategy. Well, Kathy, I had not come across that particular site. Thank you for sharing your experience with them and, as time is of a premium for me, I will accept your experience with them as good enough for me. Do let us know if anything ever comes from it though. Thanks for an informative post, Kathy. Great post, Kathy. 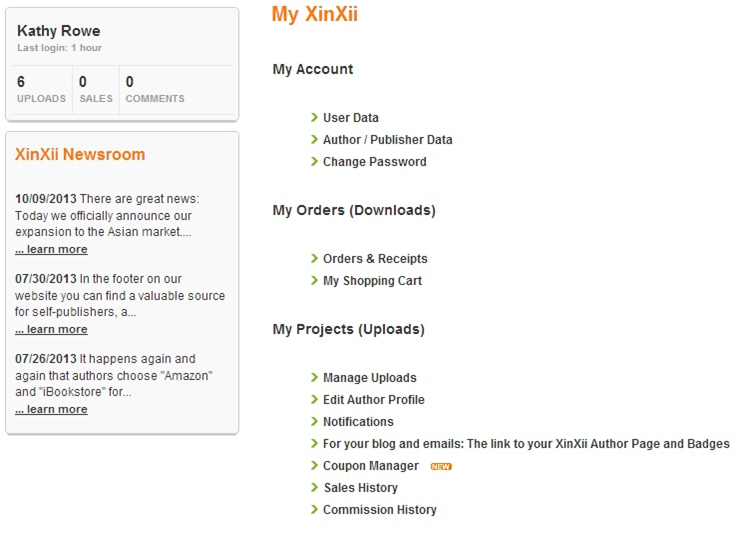 I’ve been on Xinxii for a while now, and I think I’ve had one sale. Their customer service is great, but the sales just aren’t there. I’ve heard the same from other writers, as well. I tend to think they just haven’t marketed enough in the US. It was by accident I found them, which is not good if you are a business looking for sales. Interesting, I guess that big question is it worth the set up time to click it and forget it. Maybe one day something comes through. Thanks for making me more worldly! As a general rule, if you, interested in books as we all are, have not heard of the site, then neither have your readers. That’s why you’re not getting sales there. Now some sites serve different countries, but if your books aren’t translated into those countries’ languages, or you’re not marketing there, you’re not going to get many sales that way either. So, that’s why you’re not selling through them. Ditto for the sites that they upload to — unless they’re sites like B&N, where I would assume that you’re already selling. In that case, you’re only diluting your sales rank with two editions of the same book. NOT a good idea. In short — I would advise people to stick with the sites that have serious reader traffic, and that focus on your target markets (geographic and otherwise!). FWIW, which, as with all free advice, is about what you’re paying for it! Very true. My thoughts were you never know until you try. And for IU folks in Europe, it may be a good market. I won’t be using them. And BTW, it’s usually pronounced Shin Shi. Thanks for taking the trouble to post so comprehensively. Thanks for the heads-up, Kathy — I’ll pass on these guys, I think.